PC2E’s Action Fund will focus its work on the upcoming 2018 Newark school board elections, while also taking this opportunity to refine its strategic plans regarding continued parent organizing and engagement. Okay. What’s really going on? Here’s the real story: sadly, PC2E is a ghost of its former robust self. After a grand beginning — I visited the Broad Street office several times over the last two years and remember the bustle and excitement of offices staffed by motivated directors, parents sitting at tables making phone calls, new signs arriving for distribution — this organization dedicated to amplifying parent demand for quality schools, as well as an expansion of the city’s popular charter school sector, is almost invisible. Its website is down (at least as I write this). No one works there anymore. PC2E’s demise is largely due to the antics of its Executive Director Muhammed Akil but the truth is that it had already begun to lose parent support. 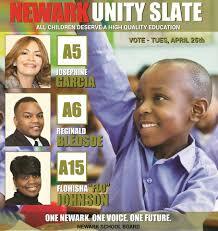 Its strategy was to triangulate Newark’s divisive ward politics during school board elections and create three-person “Unity Slates.” Mayor Ras Baraka would choose one member. Another high-profile ward leader would choose another. PC2E would choose the third candidate. This strategy was a rousing success that first year. In April 2016 two pro-reform candidates were elected (PC2E’s pick, Kim Gaddy, and North Ward Councilman Anibal Ramos’ pick, Tave Padilla) as well as the third member of the Unity Slate, Mayor Baraka’s anti-reform pick, Leah Owens. But the following election cycle this past Spring, many members of PC2E’s reform-minded parent cadre were disillusioned by what they regarded as the organization’s deference to Baraka. Some told me at the time that PC2E’s leaders had allowed the Mayor to veto stronger choices. They felt let down and their disenchantment showed at the polls where turnout was down by half. For more detail, see here. An optimistic read was that PC2E was just finding its way, coping with growing pains. But now, with the recent revelations of Akil’s antics, the damage appears more serious. Whatever. Akil apologized but decided, he said, that he had become a “distraction.” He left and began work at PC2E. [A] voicemail accidentally recorded more than three years ago when Akil was working as Fulop’s aide was leaked. In the recording, Akil and Shawn Thomas, then the city’s deputy housing director, can be heard talking about the bid process for hiring an energy consultant in 2014. After the call, Akil tells what’s presumed to be Thomas, “This is the kind of s*** where mother****ers go to jail.” Akil told The Jersey Journal he did not remember the context for his statement about people going to jail. Senate Place, LLC, which according to NewJerseyBids.com owns 25 Senate Place, received a tax abatement from the City of Jersey City, donated $1,000.00 to MTR. According to the Hudson Reporter, the first vote to approve was postponed because of public outcry against the project and developer. CME Associates, an engineering firm, donated $3,770.00 to MTR. According to the Jersey Journal, CME has received hundreds of thousands of dollars in contracts from the Jersey City MUA. DeCotiis, FitzPatrick & Cole, LLP, a law firm that represented Spectra Energy, which built a gas pipeline that goes through Jersey City, donated $7,540.00 to MTR. According to the same Jersey Journal article, the firm has also received lucrative contracts from the Jersey City MUA. Ah, New Jersey, the Soprano State. Brindle is right: the public loses out, and that includes the pro-choice parents of Newark who put their faith in a leader who failed them. We’ve got to do better than this.